I came across this very brief video of what is claimed to be one of the Buick "Bug" racers that William Durant's team raced in 1910. 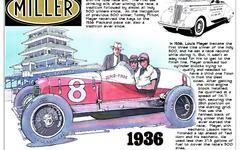 The drivers were Louis Chevrolet and Bob Burman. Who knows if cars like this are truly authentic or largely fabricated. Either way, the machine has historical value.